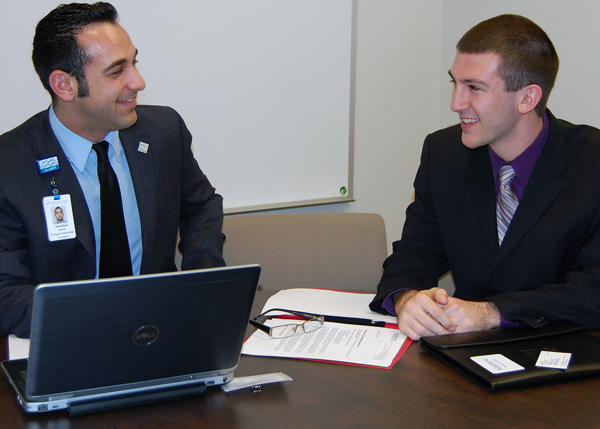 Jonathon Fauvie, gift officer at Mercy Health Foundation, Mahoning Valley, interviews Matthew Yourstwosky, marketing major from Canfield. Students in Youngstown State University’s Williamson College of Business Administration will interview for internships with area employers 8 a.m. to 3 p.m. Friday, Oct. 23, as part of the Fall 2015 WCBA Internship Interview Day. The interviews will take place in Williamson Hall at YSU. Employers interested in participating must register by Oct. 9 by calling the WCBA Office of Professional Practice at 330-941-3660. Both regional and local employers will have the opportunity to schedule interviews with business students majoring in accounting, advertising/public relations, business administration, business economics, finance, human resource management, information and supply chain management, international business, and marketing as well as those pursuing certificates in nonprofit leadership, enterprise resource planning, entrepreneurship, and leadership. Employers will benefit by identifying highly motivated, qualified student interns; by providing extra staff assistance during crunch periods; and by obtaining assistance to complete special projects throughout the semester. More than 36 percent of WCBA graduates complete an internship through the assistance of the Professional Practice Program, located in the Office of Student Services. Students receive college credit and are paid for the internship. The internships are often short-term, project-specific work opportunities that allow students to earn college credits toward graduation. To learn more about internship and cooperative education opportunities, contact Christina Costello, assistant coordinator of the WCBA’s Professional Practice Program at 330-941-2376.